San Diego Railroad Museum and Train Rides - TourGuideTim Reveals San Diego! Cost: $5 ($2.50 for ages 6-12); Train Rides are Extra. Features: 1916 Train Depot is home to Over 80 Train Cars and Locomotives, many dating back to the 19th Century, Hour-Long Train Rides; Setting for Numerous Movies and Commercials. San Diego Railroad Museum Highlights: The Campo Train Depot was a stop on “The Impossible Railroad”, otherwise known as the San Diego and Arizona Railway. Today, it is home to over 80 railroad cars and train engines that are being restored by local train enthusiasts. You can tour dozens of railcars, locomotives, and cabooses, many of which served the original railroads back in the late 19th century. See what it was like to ride the train in the good ole days by taking one of the hour-long or more train rides that are given each weekend. Explore the Museum and its railyard that has been the site of numerous movies and TV commercials since 1923, including this Levi Jeans commercial filmed in 1999. (A fashion model creates new cut-off jeans thanks to the help of a passing train.) One of the more recent well-known movies filmed at the Museum was ‘Pearl Harbor’. Train Engines & Railroad Cars – You will get to explore and learn more about 80+ pieces of train equipment, including five Steam Locomotives, thirteen Diesel Locomotives, ten Cabooses, and about two dozen each of freight Railroad Cars and Passenger Railcars. Many pieces are still in the process of being restored as funding permits. (Consider making a donation to help restore these historical treasures.) 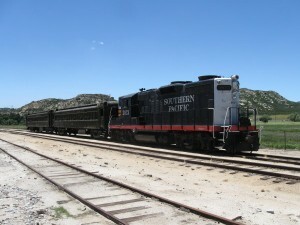 You will see train cars from as far back as 1875 that have been used on such rail lines as the Santa Fe, Union Pacific, Southern Pacific, Pullman, and AMTRAK. 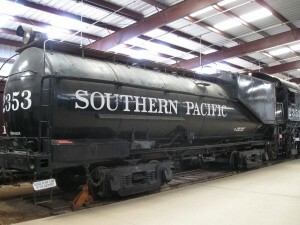 The Museum has in-depth descriptions and a history for each of its railroad engines and train cars. Train Rides – Every weekend, you can take a ride aboard one of the trains. Most train rides last for 1 to 1.5 hours. 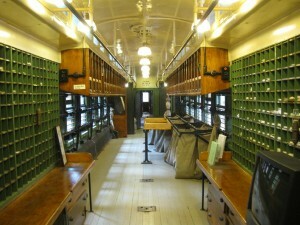 Afterwards, you will get a walking tour of the Train Museum’s restoration area. On some weekends, special excursions are planned, including a trip to Tecate, Mexico where you will have 3.5 hours to spend enjoying lunch (or dinner during their twilight trip) and the festive atmosphere in Tecate. Make a memorable visit to the San Diego Train Museum by including a train ride. Tickets can be purchased online. Some trips do sell out, especially the Tecate Trip. Prices start at about $15 for adults ($5 for Kids ages 6 – 12 years old). Special Excursions cost more. For most trips, there is room for two people to make advance reservations to ride in the cab of the locomotive. Have fun! Southern California Railroad History – Learn the history of railroads in San Diego from several articles provided by the San Diego Railroad Museum. You can also get San Diego and Arizona: The Impossible Railroad from Amazon that retells the story of the last transcontinental railroad that included a stop here at the Campo Railroad Station. Campo is a remote location outside of the metropolitan San Diego area. Despite its remote location, you can make a nice day trip to Campo by driving along the scenic SR-94, which is part of the old stage coach trails and curves around the mountains in the area. Once you are in Campo, spend a few hours visiting the Railroad Museum, the Motor Transport Museum and the Gaskill Brothers’ Stone Museum. You may even consider visiting the start of the 2,650 mile Pacific Crest Trail, which is also in Campo. Relative to the rest of San Diego weather, Campo weather is more unpredictable. It can be much warmer than Coastal San Diego during summer months (Desert Forecast) and much cooler during the winter months (Mountain Forecast) so dress appropriately since you will spend a fair bit of your time outdoors looking at the historic trains. Food – Your options are limited in this remote location. The Campo Diner is very close by. You’ll find a few more diners off of the I-8 freeway and along SR-94. Smoking is not allowed at the Museum or on the Trains. Train Rides are extra, as noted in the Train Ride section earlier. Directions from Google Maps to 578 Parker Road in Campo, CA 91906. (Look for signs near the intersection of SR-94 and Forest Gate Road.) For those visiting from Downtown San Diego and nearby areas, Google Maps will recommend SR-94, which is a two lane country road. You may want to re-route the map (by dragging the blue line) to use highway I-8 instead. Or, you might want to take the SR-94 out to the Museum to enjoy the scenery and curvy roads and take highway I-8 back. Both routes will take about the same amount of time since the distance is a little longer using highway I-8. Traffic – Weekend travel to Campo is relatively easy whether you use the I-8 or SR-94. 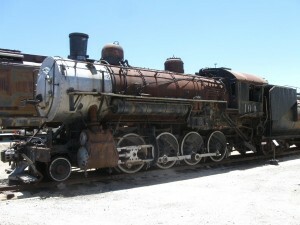 Transit - There are no transit options to get you to the Railroad Museum in Campo on weekends. Related Attraction – If you prefer to visit an old train depot closer to the San Diego Coast, consider visiting the restored 1915 La Mesa Depot, which is run by the same organization as the San Diego Railroad Museum. However, it has a very limited number of train cars on display for visitors. Here is the museum’s list of current forms of identification that can be used for the Tecate trip: http://sdrm.org/events/tecate/#customs Since re-entry requirements have been changing recently, it is best to check this link when making your reservations. Also note that advanced reservations are required because your name must be submitted to the Department of Homeland Security before you take the trip. Enjoy! Do I need a pass port to take the trip to Tecate Mexico? ?